Why not make your last night of freedom something which you will love to talk about for long in Pitlochry. This party destination has got all the goods to design a memorable party weekend for you stags and hens. With so much to see and do, you will love partying here for sure, its happening nightlife and sizzling party scene speak a lot about this place. 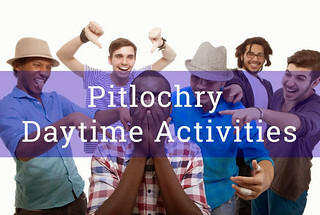 Pitlochry has for long time been holiday destination for tourists since the Victorian ages is easy to get to as it's got a train station on the main route from Edinburgh to Inverness. Being a holiday destination for so long means there is a lot to do in and around the area of Perth Shire. While in Pitlochry why not visit Killiecrankie, the Hermitage near Dunkeld or the Queen's view overlooking Loch Tummel. There's a great selection of accommodation including hotels, bed-and-breakfast, caravans, camping, self catering holiday cottages. With activities like clay pigeon shooting white-water rafting, quad biking, duckies, rockclimbing, Marton biking and so much more, there something for everybody. Pitlochry is also known as the gateway to the Highlands of Scotland, it's a great place to stop off if you're heading up North to Aviemore, Inverness and other Scottish destinations.